Sure, you can spend lavishly and enjoy just about any vacation your heart desires when you come to Puerto Rico, but it's also nice to know that you don't have to break the bank to have a good time. In fact, you have your choice of free activities in Puerto Rico to enjoy. Here are the best ways to spend absolutely nothing and have a blast doing it. This one's for art-lovers in particular. If you're lucky (or wise) enough to be in Old San Juan on the first Tuesday of every month in peak season (February to May and September to December), step out on the town for a night of art appreciation and free wine. Roughly 20 galleries (and they're among the best on the island) keep their doors open late on these nights, inviting everybody in to take a look at their collections. The atmosphere is a blend of open-air museum and cocktail party. Traveling minstrels sometimes take to the streets to add a touch of quaint charm to the evening. Every town in Puerto Rico has a patron saint, and every saint is honored once a year in a Festival Patronal, or "Patron Saint Festival." Add up the number of towns on the island, and you're talking about a festival every week. Throw in the fact that the party tends to go on for days, and you'll realize they're a terrific way to catch the music, culture, dance, and local flavor. They're also absolutely free (except for the food, naturally, which I highly recommend). Now, getting to whichever town is holding its festival is another issue, but a público should do the trick without hurting your wallet. Speaking of festivals, the biggest one of them all occurs in Ponce: The Ponce Carnival is an annual can't-miss all-out party. Bacardi's distillery in Cataño (the world's largest rum distillery), is just a stone's throw from Old San Juan, is open to visitors year-round. A trolley tour takes you through the history of rum-making on the island and Bacardi's origins. You also get to test your olfactory prowess, and, of course, you get a complimentary drink. The tours fill up early, so call ahead before you go. By the way, if you're using a tour company to visit Casa Bacardi, you'll pay around $30, but the good people at Bacardi don't charge for their tours. The trick is to take a ferry from the pier in Old San Juan (at a small cost) and then grab a taxi to the factory (which will set you back a few dollars). 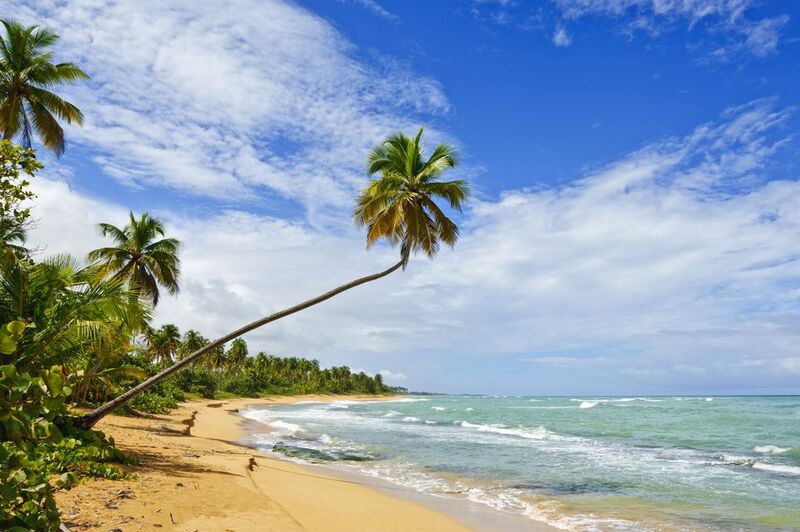 You can't argue with the beauty, popularity, and price of admission of Puerto Rico's beaches. One of its most alluring assets, the island's beaches (over 270 miles of them!) are a main draw for millions of tourists. Note, however, that not all beaches are free. At public beaches, called Balnearios, you'll have to pay a parking fee, but in return, you get amenities like lifeguards, picnic areas, and restrooms. The vast majority of the island's beaches, however, are unspoiled, idyllic spots where the warm Caribbean water meets the sun-kissed Puerto Rican sand. You don't have to pay to enjoy El Yunque. It won't cost you a dime to hike your boots off in the only tropical rainforest system in the U.S. National Forest System, to strip down to your bathing suit and dive into a plunging waterfall, or to check out the forest's "El Portal" Visitors Center. However, you have to get here in order to do all of those things, and that's where the expense comes in. If you're willing to rent a car for a day, the rainforest is all yours, and it's one of the most enjoyable ways to spend a day on the island. The Ventana al Jazz, or "Window to Jazz," is a wonderful free event hosted by Heineken, which is fast becoming the patron saint of Jazz in Puerto Rico. The Heineken Jazz Fest is Puerto Rico's annual jazzathon, and it attracts some of the best names in the business. Ventana al Jazz is a byproduct of this event, held on the last Sunday of each month at the Ventana al Mar park in Condado. It's an evening of live jazz music accompanied by the natural orchestra of gentle waves breaking on Condado beach.